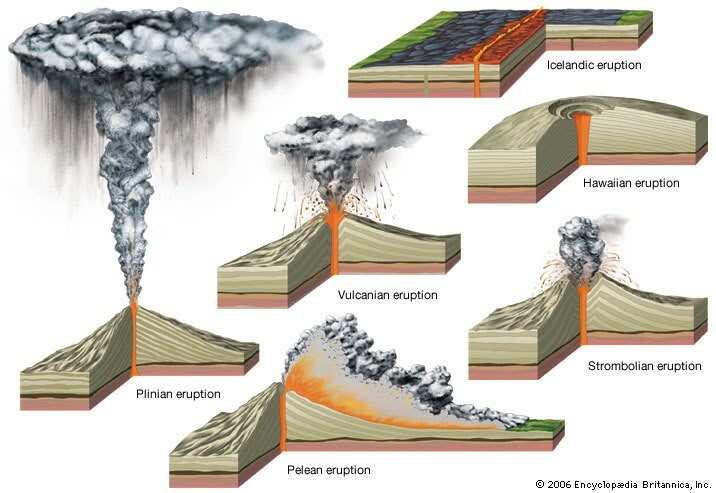 Basically, four types of volcanism can be identified. These gases may escape through vents which are in the form of hot springs, geysers, fumaroles and solfataras. Associated landforms ==> sinter mounds, cones of precipitated minerals and mud volcanoes. Effusive: Geology relating to or denoting igneous rocks poured out as lava and later solidified. This type of activity refers to abundant outpourings of lava from a vent or fissure. Lava is silica poor basic one like basalt. Hence flows through larger distances. The Deccan traps, which are composed of such lavas today, cover an area of 5,00,000 square km. The original extent of the formation must have been at least 14 lakh square km. Columnar structure is sometimes developed in fine-grained plateau basalts. 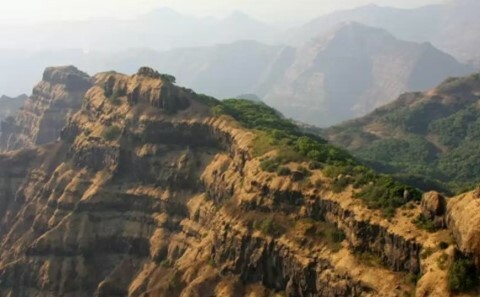 Columnar basalts are seen in the Deccan traps near Bombay. This type of activity results in fragmentation and ejection of solid material through vents. 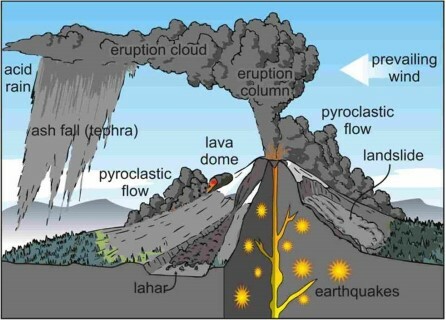 Volcanic eject that settle out of air or water are sometimes called pyroclastic sediments. Tephra: all fragmented ejects from the volcanoes. Lappilli: These are gravel sized particles either in molten or solid state. Blocks: Cobble or boulder-sized solid ejecta. Bombs: a lump of lava thrown out by a volcano. Smaller particles like lapilli and ash travel through air for many kilometres and may remain suspended in the air for a long time. The heavier particles like bombs and blocks fall only as far from the vent or fissure as the explosive force is able to hurl them. The volcanic gases that pose the greatest potential hazard to people, animals, agriculture, and property are sulfur dioxide, carbon dioxide, and hydrogen fluoride etc.. 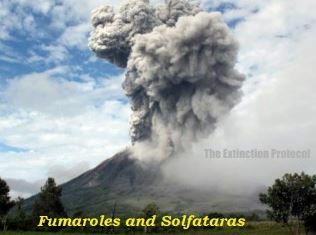 Locally, sulfur dioxide gas can lead to acid rain and air pollution downwind from a volcano. 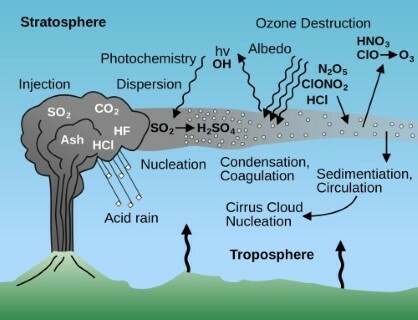 Globally, large explosive eruptions that inject a tremendous volume of sulfur aerosols into the stratosphere can lead to lower surface temperatures and promote depletion of the Earth’s ozone layer. 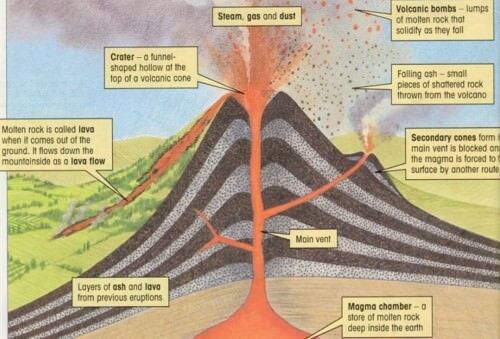 This type of volcanic activity takes places below the surface of water. Pillow lava of Pre-Cambrian Age are found in parts of Karnataka. 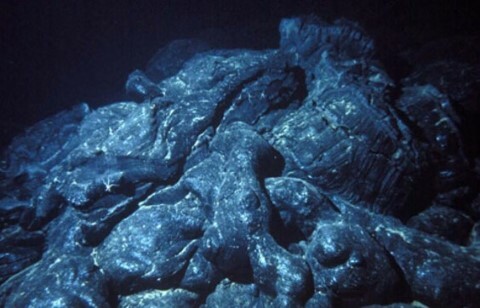 Highly viscous lavas erupted at lesser depths develop glassy margins on pillows. The related volcanic product is hyaloclastite. Most hyaloclastites identified are in Iceland. It involves the effusive outpouring of basalt lava from craters, lava lakes or fissures. 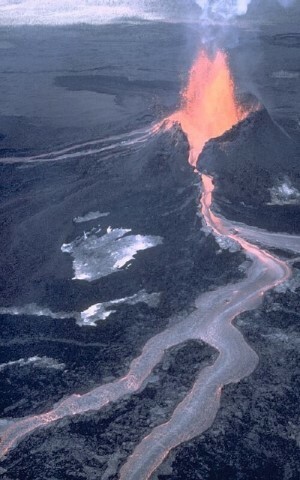 A single flow spreads widely over open slopes or flows down the valleys as lava rivers. Little gas or tephra is produced. Examples: The great basalt plateaus of Columbia and Iceland. In this case, more viscous lava is ejected upward in a fountain like fashion from a lava lake in the crater at regular intervals of around 15 minutes. Stromboli lies in the Lipari Islands near Italy. It is called the ‘lighthouse of the Mediterranean’. The molten lava which fills the crater solidifies and is explosively ejected as a great cauliflower cloud of dark tephra. Bombs, blocks, lapilli and other ejecta fall in the surrounding area. Only minor lava flows result. After each eruption cycle, the volcano is dormant for decades or for centuries. This type of eruption is the result of very viscous, gas-rich, acidic lava flowing violently over the crater rim or breaking out laterally. Hot gas and lava mixture is not carried skyward to become cold tephra but spreads downslope as a nuce ardente, continuing to evolve gas that cushions the flowing fragments. The Icelandic type is characterized by effusions of molten basaltic lava that flow from long, parallel fissures. Such outpourings often build lava plateaus.